Does any of the dev's have the pinout of the 5A22 used in the snes? I'd be very grateful if someone could give it to me. You could possibly, remove the 5A22, the cart connector and all the other componants on a snes mother board, and using your multimeter and all the patience you can muster, could deduce most of the pin functions of the chip. You could certainly, track down all the address lines of Bus A, dunno about Bus B though. you could also track down the data lines aswell (using this method). Hardware means nothing if you don't have good software. Since the 5a22 is based on the 65c816, I think the pinouts are similar. 38. M is available during phase zero and X during Phase one. 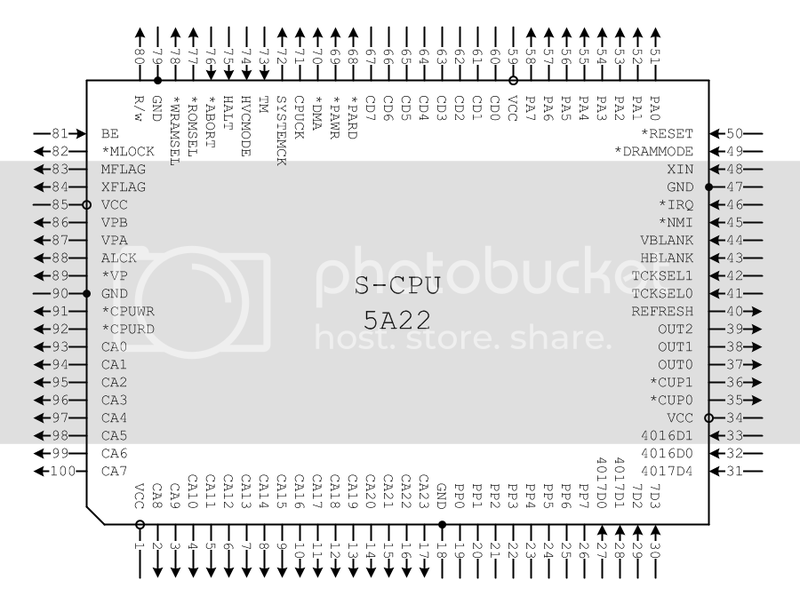 Also, the 40 pin DIP "65C816" you have shown, grinvader, is actualy a 65C802, which is a CPU that is a pin and instruction compadible upgrade for the 6502. It lacks the address lines from A16 through to A23 (which th 65816 has)and it also lacks the extra 8-bit address bus (Bus B), specific to the 5A22. Last edited by declan on Tue Mar 25, 2008 9:11 am, edited 1 time in total. You could also find the pins for the controller ports, like Clock 1 & 2, Latch 1 & 2, Data 1 & 2. There you go, another 6 pins of 100, solved! How could i have forgoten. CaitSith2 has a Zip file on his/her (i'm not sure which) website, containing snes schematics. This sould have the 5A22 and its pinout. The schematics reveal some interesting facts, which could be used to find out how the SNES works in detail. - mosaic effect (just update every nth pixel / line in the buffer). Both PPU's and the CPU have access to the 21Mhz master clock, but PPU2 also has 2 seperate signals (X & Y) going to the CPU, which is probably switching the CPU speed (4 states could be decoded). Quite unusual is the fact that PPU1 has 2 address buses going to each 32k SRAM, they probably did this so that in Mode 7, you could fetch 2 8bit pixels from seperate locations . Just to be sure: 2 address buses per 32K chip, or 1 address bus per chip? I'd guess it's the HIRQ/VIRQ lines. This seems to be currently unused though. There are 2 * 32k SRAM chips, and each chip is connected to the PPU through its own data AND address bus. Normally, you would have only one address bus for both chips, which would work for all character modes, except mode 7, where the hardware needs to be more flexible in reading pixel data from different locations each. Hmm, I suppose you could be right, but then I'd suggest its the IRQ and NMI lines. It's for interleaving data. Can help with multiple things, including mode 7. Hard to say, we know next to nothing about low-level PPU operation. My guess is that PPU2 holds all the colour registers and at least 2 line buffers for the main and sub screen and does all colour calculations. It renders in real-time, there's no full line buffer involved. You can change color (note the lack of a u in color, Britain) registers mid-scanline and see the changes. One thing it does seem to do is buffer sprite stuff on the previous scanline. If you really care, you should probably read up on NES PPU emulation, which is light years ahead of us. The SNES is similar in many ways, just a whole lot more complex. No, it would be horizontal and vertical retrace signals. The PPU doesn't know anything about when to trigger IRQs. It could BS NMIs, of course, but that's not what it does. That's the CPU's job. The CPU has its own counters that go off the PPU h/vblank states. CPU is aware of its own cycle counts and adds them normally. When PPU H goes low, it increments the V counter. When PPU V goes low, it resets the V counter. The are out of alignment by two clock cycles against the 21MHz clock, and this causes / explains some interesting edge cases with IRQs as you would expect. You don't need 2 address buses for interleaving data. It most probably fetches 2 bitplanes from each character in one word cycle. Since those 2 bitplanes are on the same word address, both address buses will have the same value at this point. The only application I can really think of where 2 address buses, 2 different addresses for each byte, are needed is mode 7, where 2 neighboring 8bit pixels could be coming from different characters. Actually, it's Germany, but thanks. registers mid-scanline and see the changes. Of course, but that doesn't explain if there is a line buffer or not. With line buffer, I mean that in 1 buffer, one line is being rendered while the other is being displayed and vice versa. That would essentially mean that the video output is always 1 line behind. The other possibility is that the line buffer is being updated the same time it is being read. The thing which brings me to this idea is that it would be the easiest way to implement the sprites and the mosaic effect. The SNES most certainly does not have 32 4bit deep shift registers, the priotity and X detection logic alone would be immense and consume much chip space. Rendering to a 256 pixel line buffer however is much more straightforward. Priority is achieved in what order sprite pixels are written into the buffer (high priority sprites are overwriting sprite pixel data of previously rendered low priority sprites), and the X position is just the starting address of the line buffer byte. Many arcade games do it this way. To acconplish the Mosaic effect, you would just have to suspend rendering INTO the line buffer for each repeated Y pixel expansion, which is much more easier than having the character/sprite fetch address logic generating the appropriate addresses to accomplish this effect: it would have to hold addresses for the y-repetition of pixels, and then add values for the next pixel block to those adresses to compensate for skipped y pixels -> too complicated in hardware, and this is excluding mode 7... Especially considering since the pixel block can have sizes of "non power of two". I think the mosaic effect belongs to those effects which hardware engineers add as an afterthought, because the architecture easily allows it. One thing it does seem to do is buffer sprite stuff on the previous scanline. Yes, the sprite engine is being started 1 line earlier to evaluate what sprites are in range, since sprite data fetches most certainly occur in HBLANK, which means that the evaluation has to be finished before the first display line starts. I know the NES PPU document, but, as you put it, the SNES is more complex. There are similarities (the whole pixel video timing for example, and the way the sprite evaluation works. Interestingly, both aspects have been copied from the TMS9918 working in the Colecovision) and there are things which are obviously more advanced. The NES has only 8 2bit wide sprites per line, for that, a whole line buffer is a waste of logic gates. Ah, ok, you are right, I see now that the H/V registers are in CPU register space ($4xxx). It's strange that Nintendo implemented the H/V counters in the CPU, effectively replicating what is already contained in the PPUs. Might as well just give this away now. Edit: New document from no$ explains pins 83 and 84. These are the X and M flags of the Status Register. (I hope). 4017D2, 4017D3, 4017D4, *DRAMMODE, TCKSEL0, TCKSEL1, TM, HVCMODE, and HALT are all tied low. *NMI, *ABORT, and PE are tied high. I would assume PE is something like peripheral enable, it's not the E-Clock output. EDIT: Pin 81 renamed to BE (Bus Enable). Active high. OUT[2..1], PP[5..0] (parallel port), *DMA, CPUCK, R/w, *VP, VPA, VPB, "MFLAG", "XFLAG", and *MLOCK don't connect anywhere. The PA_ stuff is known otherwise as the B-Bus. CA_ and CD_ are the normal CPU address and data busses. I put a C in front, because when I do schematic layout with the roms and RAM chips, there's that whole issue with A15 being used or not in LoRom / HiRom configurations. The RAM and ROM chips just have A0..A19 or whatever. Last edited by whicker on Mon Feb 27, 2012 3:59 am, edited 2 times in total. Well ultimately it's for mode 7 and for interleaved data. Because in mode 7, the name table and tile data are interleaved, with the name table stored in the low byte and tile data in the high byte of every word. They have to be stored interleaved, because the VRAM is clocked at 5.37 MHz, which is also the pixel clock. Because mode 7 allows for free scaling and rotation of the background, there's no guarantee that pixels that are adjacent on screen are contiguous in VRAM - thus it needs to load name table data and tile data every pixel, rather than every tile. But because the PPU can only read 1 word of VRAM every pixel, the name table and tile data need to be interleaved, and the PPU needs to be able to read the high and low bytes from different words - thus there are two separate VRAM address buses, one for the low byte, and one for the high byte. So every pixel clock, the PPU reads the name table data for the next pixel from the low byte while reading the current pixel's color data from the high byte. This is also why mode 7 tiles are stored in packed-pixel format, instead of the planar format of all other tile data. The PPU has a single linebuffer, but it is used for sprites only. (The linebuffer is actually composed of 2 128x9-bit linebuffers, each one storing 4 bits of color data, 3 bits for palette number, and 2 priority bits - one linebuffer stores the even-numbered pixels,the other stores the odd-numbered pixels. The linebuffers are clocked at 10.7 MHz when being written to, and have separate address lines; this arrangement means that 4 pixels can be written to the linebuffer every pixel clock.) It only needs 1 linebuffer, because memory access patterns dictate that it's impossible to render sprites while they're being displayed. Backgrounds are generated via shift registers, just as in the NES. There are six pairs of 16-bit shift registers, coupled to six pairs of 8-bit temporary registers, labeled a, b, c, d, e, and f. There are also 4 BG attribute registers, each connected to a delay circuit that hold its previous two values, and 4 temporary BG name registers. There are also two tile offset control words, one vertical, one horizontal. There are four types of BG reads - name table reads, tile data reads, and offset reads. On a name table read, the attribute bits (3 for palette, 1 for priority) are stored in the appropriate attribute register, and the tile index is stored in the appropriate name register. On a tile data read, the data is written to the appropriate temporary register n, with the low byte going into temporary n0 and the high byte into temporary n1. On an offset read, the data is written to one of the tile offset control words (in mode 4, bit 15 selects which control word to write to; in other modes, bit 15 is ignored); because offset reads come after attribute data reads, the first tile on each scanline is not affected by tile offset, and the offset read affects the next set of tiles. Finally, of course, there are mode 7 data reads, which read 8-bit color data over the high bus and the tile name for the next pixel over the low bus, and increments the mode 7 horizontal accumulators. Theses are the only transfers that will put different addresses on the two VRAM address buses. Furthermore, mode 7 completely overrides the shift registers - instead, the color data byte is used directly as the BG1 color data, and in EXTBG mode, bits 3-0 are used as BG2 color data and bits 7-4 as BG2 attribute data. The video mode selects which shift registers are used to generate each BG's color data, and determines the PPU's read sequence (the pattern of 8 VRAM reads the PPU performs for every rendered tile). In 1 scanline, the PPU performs 33 BG read sequences (264 pixel clocks), waits 9 pixel clocks for the active scan period to end (because video output doesn't start until 17 pixel clocks after BG reading begins), and then loads 34 sprite tiles (68 pixel clocks). The color data from each background layer is then combined with the current pixel from the sprite linebuffer (note that the linebuffer is erased as it is read) and fed into the priority circuit to determine what is actually drawn. The PPU's internal clock rate is actually 10.7 MHz (or half the master clock), meaning each pixel takes 2 PPU clocks. The first PPU cycle of each pixel generates the sub screen pixel, and the second cycle generates the main screen pixel. The output of the color math circuit is latched every PPU clock in H 512 mode, or every other PPU clock otherwise, and is then sent to the video encoder. Because the color math output is latched every PPU clock in H 512 mode, color math does not function as expected. The mosaic system is actually composed of two sub-systems, one for horizontal, and one for vertical. The color data from the shift registers feed into a series of latches; these latches are controlled by the horizontal-mosaic system, which causes them to latch the color data every X pixel clocks (where X=1 if mosaic is disabled for that BG layer, or the mosaic size if it's enabled). The PPU also maintains a vertical line counter - the vertical mosaic system latches this counter every X scanlines (again, X is the mosaic size). If mosaic is enabled for a BG layer, it uses the latched counter, otherwise it uses the normal counter. This is then added to the layer's vertical scroll register or the vertical tile offset to determine which tile data row to load. This is why you don't get a pure mosaic effect if you have mosaic active while using HDMA to change the vertical scrolling registers or mode 7 scaling/rotation registers. uh, one question: how do you know all of this? I would love to see byuu comment on Grigori's post. And to motke, good luck... byuu has basically alienated just about everyone these days (meaning the only real way to get a hold of him is on his BSNES forum). I would assume PE is something like peripheral enable, it's not the E-Clock output. I think you made a mistake. It's "BE", not "PE". buffers are disabled. Bus Enable is an asynchronous signal. I stumbled upon this by incident while looking at your Pinout which BTW has helped me out nicely for building a RS-232 Interface for my SNES. Thanks ! Post and image changed above to reflect ngevan2k's finding. I really wish there was a better scan of the official schematics. My copy is scanned at slightly too low of contrast, skewed, folded, split into 4 parts, and saved as JPG. BAH I'm with stupid(that's me). And that's a long story.